Kris Meeke wins the 2017 Rally Mexico, the third round of the 2017 World Rally Championship. Winning a rally at hot Mexican gravel, the Northern Irishman scored his fourth WRC win a career and the first with all-new Citroen C3 WRC car. 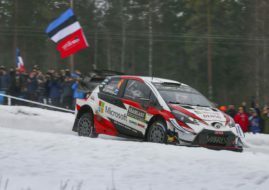 Meeke is a third different winner with third different car in an era of new World Rally Cars, after Sebastien Ogier won Rallye Monte-Carlo with Ford Fiesta WRC and Jari-Matti Latvala triumphed at Rally Sweden with Toyota Yaris WRC. Of four manufacturers, only Hyundai has yet to score a victory with new car. Thierry Neuville was again among the front runners, finishing in the third place at Mexican event, 59.7 seconds behind Meeke. Sebastien Ogier reached second place in Mexico, 13.8 seconds behind Meeke, to take over the lead in the championship standings after three events. Ogier collected 66 points in three events. Jari-Matti Latvala, who finished sixth in Mexico, is in the second place of WRC drivers’ standings with 58 points. With two drivers in the top 5, as Ott Tanak finished fourth in Mexico, M-Sport World Rally Team increased its lead in the Manufacturers’ standings. The 2017-edition of Rally Mexico started on Thursday evening with two short street special stages on the Mexico City’s Zocalo Square. It was the first appearance of the WRC in the 20-million capital of Mexico. The evening programme in Mexico City was spectacular, with 200,000 spectators watching, but that event also caused logistical problems a day after. Mexico City is about 400 km from rally base in Leon, so rally cars had to be transported by trucks. Due to closure of the highway, transport was late and two Friday’s stages was canceled. Kris Meeke was the fastest in the first proper stage, the 54.90km long El Chocolate on Friday afternoon, taking a lead ahead of Sebastien Ogier and Hayden Paddon. Meeke stayed in the lead until the last day, scoring three more stage wins over three days. Thierry Neuville was the fastest in the 21.94km Power Stage, winning five additional points. Kris Meeke had a big moment during a Power Stage, going off the road and losing twenty seconds to Ogier, but he didn’t lose an overall lead.